Back in the late 1800s to early 1900s, it was said that if you walked into any train station in the Grand Rapids & Indiana Railroad line and asked for a ticket to Hell, the agent would hand you a one way ticket to Walton Junction without batting an eye. Here is the short, fascinating history of that long, lost town. This 1-2 mile area, where three sets of train tracks meet in a rounding triangle, was the perfect place for my characters to live. While most maps either have this location unnamed or call it Fife Lake, the name Walton kept popping up. Walton Marsh, Walton Outlet, and then I found the original name for this area: Walton Junction. An Internet search for Walton Junction brought up almost no information, so I went to Fife Lake, the nearest town a few miles to the north. The curator of the Fife Lake Historical Society, Craig Bridson, not only shed some light on this former town, but he even took me out to the location to see for myself what is left of Walton Junction. The short answer – very little. Most people agree that Walton Junction started in 1872, when the Stronach Lumber Company, a major timber harvester, opened a store and a boarding house. However, in 1873, Walton Junction really sprang to life at the site where the Grand Rapids & Indiana (GR&I) railroad went off west toward Traverse City, south to Cadillac, and north toward Fife Lake and Petoskey. 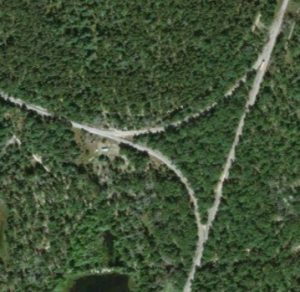 (There was even a fourth set of tracks, the Manistee & Northeastern, that went under these three sets of tracks, heading from Kaleva, north of Ludington, to Grayling. Those tracks have since been filled in.) GR&I selected this area as the location for their construction headquarters, it being the starting point of their branch line to Traverse City. A foreman on the construction crew, Abram F Phillips, built the first house, while Henry A Ferris built a road down to the Manistee River. With both the promising location as a railroad junction and a road to the river, Walton Junction was officially founded in 1873, with JL Gibbs as the Postmaster. Robert Knaggs built the fancy Walton Hotel in 1875, and two smaller hotels popped up by 1877, as did a store and a train ticket booth. By now, the population had grown to around 100. With travelers changing trains and having layovers, the hotels prospered. 1880 saw the first saloon, built by Henry Ferris. This watering hole was not just for the railroad workers. 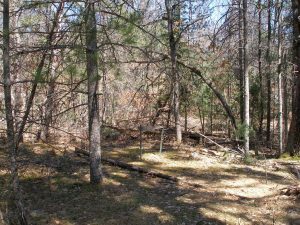 It was for travelers passing by on the rail, as well as the many lumberjacks and the rivermen, who moved the lumber down the Manistee River. 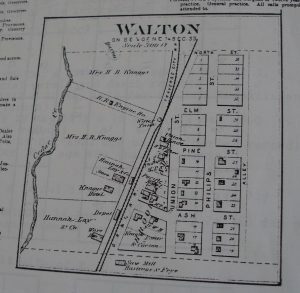 The location of Walton, between the Manistee and Boardman Rivers, made it handy for “hundreds of men” to get together, for some drink and a “friendly fight” on weekends. By 1885, Walton Junction had three hotels (The Exchange, formerly the Walton Hotel, the GR&I House, and the Commercial Hotel), and as many as thirteen saloons (ten stand-alone bars plus the ones in each of the hotels). They also had two general stores, a blacksmith, a druggist, a carpenter, a station agent, and two doctors (who were undoubtedly kept busy due to all the brawls – but more on that later). Also, if the rumors are to be believed, there were upwards of four bordellos, called “Bawdy Houses” back then. One man, Dennis Thralls, ran a furniture store, was the undertaker, the justice of the peace, and the postmaster. The regular population was now up to 200, but because this was the only place between Traverse City and Cadillac where a tired and thirsty lumberjack could get a drink and feminine companionship, Walton Junction could swell to upwards of 2,000 on the weekends. On Fridays, around suppertime, trains from the north and south would let the young men loose on the town. It was said that the respectable women ushered their children and husbands into the security of their homes, staying inside behind locked doors until Sunday evening. After an evening of hard drinking, the fighting would soon commence. Stories of the brawls between the Jacks (lumberjacks) and the hogs (what people nicknamed the rivermen) were legendary, as was the “brutal rivalry” between the Jacks and the railroad men. The railroad crews from Clam Lake (now called Cadillac) would head to Walton Junction, looking to mix it up with the Jacks coming over from Traverse City. Sometimes, even the best of friends just wanted to let off some steam. Given that the visitors were primarily young and single men, as the evening wore on, drunken brawls were common. In fact, they seem to be the major source of entertainment. These fights apparently never involved weapons such as guns or knives. The men would stand toe to toe and slug it out. If a man was knocked down, he was given room to get back on his feet. When one of the contestants could no longer stand, it was acceptable for the victor to “brand” him by stomping on his body with the lumberjacks’ steel caulked boots. They called this pocked-marked pattern, “lumberjack smallpox.” The bleary-eyed losers would often limp back into their camps on Sunday night having lost a tooth or two (and in one case, showed up with his ear in a paper sack, looking for a doctor to sew it back on) but having gained a case of lumberjack smallpox. Walton became notorious for hundreds of miles, hence the “ticket to Hell” moniker. Without much in the way of law enforcement (they were between Grand Traverse and Wexford Counties but did not receive help from either), it was mostly left up to the bouncers and barkeeps to keep the peace. Around 1890, DeWitt Clinton Leach, the Grand Traverse Herald publisher, established a cranberry farm, Walton Junction’s only actual industry. A few blocks south of town sat a pond and a marsh. Leach had a 200-foot earthen dam built, as well as sluice gates to control the water levels. He had trenches dug, and planted cranberry bushes on the ridges in the bog. The first several years were immensely successful, with annual yields of around 1,000 bushels, harvested mostly by Native American pickers. However, Mother Nature had other plans. On July 10, 1898, the region experienced a hard freeze, destroying the entire cranberry crop that year. He had even worse problems with the muskrats, who tunneled through the dam and dug in the ridges, toppling the bushes. Nothing he tried worked, and by around 1910, he sold the failing business to GA Babcock, who then closed it entirely around the early 1920s. The earthen dam still exists today, separating the Marsh from the Outlet. 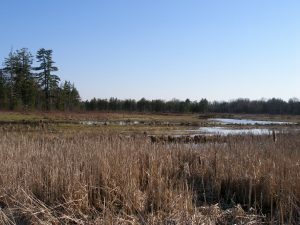 The occasional cranberry bush can be seen scattered throughout the bog. Walton Junction’s regular population (not counting those wild weekends) peaked in 1903 at around 250 people. By then, the timber was gone, so the lumberjacks moved on. The automobile business was starting to pick up, so people weren’t using trains for daily travel as much anymore. This caused some of the businesses to relocate. At this point, only the Exchange Hotel remained, as did a couple of restaurants, a general store, carpenter, and one of the saloons. By 1917, the population was back down to 100. Then around the time that the newly built highway bypassed the town, the train station closed, signing Walton Junction’s death warrant. With businesses closing, the people began to move away as well. With no one to sell to, the property owners would just abandon their houses. The ownership reverted back to the county. A few studious entrepreneurs waited until auction time, buying up the properties for cheap. They weren’t doing it for a possible Walton Junction revival, though. Instead, they would gut the houses for everything valuable, including the lumber and concrete, selling it all off. Then they would stop paying the taxes, and again let the land revert to the government. That’s the main reason why Walton Junction can’t be called a ghost town. There is simply nothing left. Even the foundations have been reclaimed by nature. 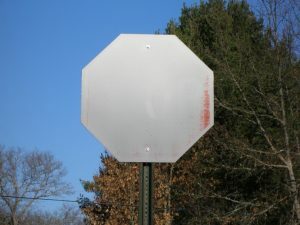 The only sign that Walton Junction ever existed is, quite literally, this sign. 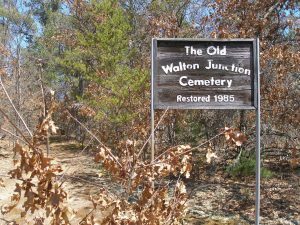 The Walton Junction Cemetery, like the rest of the town, has been reclaimed by nature. In fact, there are no tombstones or obvious areas where the people were laid to rest. It looks more like a forest than a cemetery. In fact, most of the bodies had long ago been relocated to the Fife Lake Cemetery. 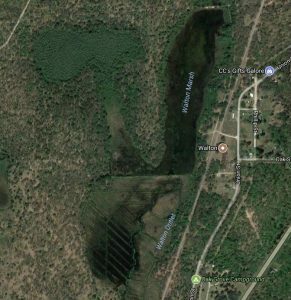 However, rumor has it that as many as thirteen bodies remain here (workers, landowners, Native Americans, or other transients), spread out among the trees. This is still a sacred place, but with people who are lost to time. Note in this picture of the cemetery the piece of wood fragment affixed to two metal poles. This much older cemetery sign still bears some faded words, but time has mostly erased them. Walton Junction had a rapid rise and an equally fast decline, but was a Hell of a good time when it was around.